Do you overeat simply because the food is there, because you’re stressed out or maybe because you’re just bored? There are many reasons people eat, and most have nothing to do with hunger. What’s more, if your overeating is chronic, feels out of control and is coupled with negative feelings like shame, guilt and sadness, you may have binge eating disorder, the most common eating disorder in the US. But going on a typical diet isn’t the answer. Instead, consider mindful eating. Based on the Buddhist concept of mindfulness, mindful eating teaches you to hone in on signals of hunger, taste and fullness, learn to enjoy food, shed your guilt or fear about food and eating and potentially lose weight in the process, explains Jean Kristeller, PhD, a pioneering researcher in what she calls “mindfulness-based eating awareness training” or MB-EAT. Mindful eating is not a diet, and no food or food group is off limits. The goal is to learn to eat when you are physically hungry and stop before you become too full…but also to eat when you are celebrating, need a little comfort, or are out with friends or family without over-doing it. You look for physical hunger cues such as a growling stomach or weakness, rather than mostly feeding anxiety, stress, boredom or procrastination with food. You also learn to not give into the “I’ve blown it effect” where just a little indulging turns into a binge. You also learn to fully taste and enjoy your food. It’s not about taking 32 chews per bite or any such diet advice. Instead you simply eat slowly, stay in the moment and notice taste, texture and other sensations. You learn to find your inner gourmet! And far from being a chore, eating this way is something that is pleasurable and can become second-nature to you—just look at the French. They take twice as long to eat and eat about half as much as people in the US because they are not gobbling down food—they pay attention and savor their food, said Dr. Kristeller. Another part of gaining control over food is getting in tune with how much you really need. On a scale of 1-10, with 1 being not full at all and 10 being as full as you could ever get, you want to strive for a happy medium—you should not end a meal feeling either stuffed or still hungry. When you can recognize feelings of hunger and satiety, eating returns to being an intentional and even more enjoyable act instead of a mindless one. 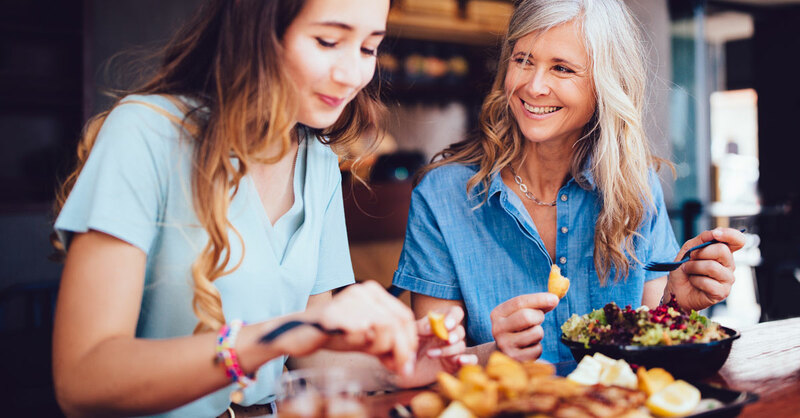 In one of the many studies led by Dr. Kristeller, a 12-week mindful eating program helped 95% of participants diagnosed with binge eating disorder conquer the condition. They learned to eat less while enjoying it more. The beauty of this training is that there are many ways to tap into its benefits and make it work for you. Choose the program that fits your lifestyle. There are many options, such as live interaction online sessions offered by Dr. Kristeller and the Eat Right Now© program, which uses mindfulness to help with food cravings. There are also in-person group sessions like the 8-Week Program at the UC San Diego Center for Mindfulness. Workshops or retreats such as those offered by MB-EAT or Well Nourished are introductory courses that last a weekend or a week. Consider each program’s pros and cons before you choose. For instance, if you attend a retreat, you’ll be in a safe and controlled environment and can learn a lot, but you’ll need to apply all that you learned once you get home and are on your own. If you participate in a weekly online or group program near home, you’ll be in your home environment to practice what you learned until your next session. Investigate teacher credentials. The program leader should have completed a mindfulness-based training program for teachers and/or have practiced under the guidance of a senior teacher ,as well as taken a professional training program in mindful eating such as those offered by Dr. Kristeller at Kripalu, the Mindful Eating Training Institute or through The Center for Mindful Eating. He or she should also have a professional background related to working with eating disorder issues. Keep practicing. Studies have shown that the more you practice these techniques, the better your results. Learn from your missteps. Don’t beat yourself up if you have a setback. Instead, let it teach you. Identify what triggered the episode—work stress? a fight with a loved one?—and what you could have done differently. Understanding what happened is key to avoiding the same sort of lapse again. Reshape your relationship with food. It’s OK to “use” food for comfort as long as you’re aware of what you’re doing and how you’re doing it. Mindful eaters readily acknowledge this, but instead of eating a quart of ice cream, they have a small scoop…but really enjoy it, with zero guilt. Once you become a mindful eater, you, too, will be able eat reasonable amounts of foods in ways that are satisfying without any fear of overeating.